Delegates from a number of local groups met in Woonsocket, R.I. in March of 1900 and voted in favor of establishing a new federation that would seek to unite fraternally minded persons of French-Canadian origin living in the United States in order to contribute to their individual and collective progress. For these delegates, progress was not only financial, but educational, cultural, and social. 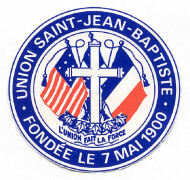 The officers and directors named at that meeting subsequently voted to establish Union Saint-Jean-Baptise (USJB) on May 7, 1900. During the latter part of the 19th century local mutual assistance societies had sprung up in most of the heavily populated Franco-American centers to assist needy families when illness or death occurred. Whenever a member died, each surviving member was expected to donate $1.00 to his survivors. By bringing together many local societies scattered throughout northeastern and midwestern cities, individuals and especially their dependents, could be better protected from the changes in fortune brought about by the sickness or death of a family provider. Ethnic solidarity–a sense of the community’s obligation to care for its own people–was at the heart of this movement. L’Union fait la force–In Union There Is Strength–became both the motto and the rallying cry of the new organization as it strove to become the “national” society for Franco-Americans. It would succeed in its aim, especially in the Northeast and Midwest, where large concentrations of Franco-Americans could be found. USJB’s first officers, who served from 1900 to 1902 were principally from Massachusetts, Rhode Island and Vermont. As early as 1902, the first vice president was from Illinois, and the spiritual director was the venerable and revered Rev. F.X. Chagnon of Champlain, New York, who had played an inspiring and respected role in the general conventions held by Franco-Americans throughout the Northeast and Midwest in the late 19th century. This wheel would come full circle in 1991 when once again USJB sought and found an ally in the Midwest–this time in Milwaukee, Wisconsin–when it merged with Catholic Family Life Insurance (CFLI), founded for the same purpose as USJB, to protect and assist an immigrant group, in this case the Germans. Like USJB, CFLI has a history that in can point to with pride. CFLI is the oldest Catholic fraternal benefit society in the nation. It is the first fraternal to issue a policy, first to offer insurance to women and children, first to adopt the legal reserve system, and first fraternal to pay dividends to members. USJB is energized by the realization that it can count upon the wholehearted support of Catholic Family Life Insurance even as it remains true to the ideals of promoting the cultural and religious survivance of Franco-Americans.